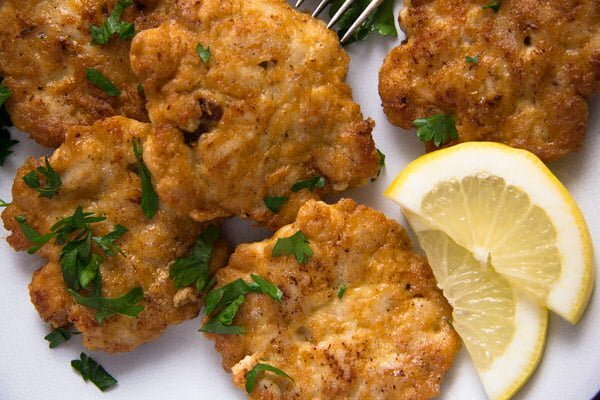 A Russian recipe for chicken fritters or chicken patties, whipped up in no time and bound to make your children (or anyone else) happy. As mentioned in the last post Chicken Shawarma Plate, I’ve decided to cook a few international dishes for the next weeks, typical dishes from the countries participating in this year’s Football World Cup taking place in Russia. I started with a dish typical for the Middle East and something very commonly eaten in Saudi Arabia as well, Saudi Arabia being one of the football teams playing in the first game of this year’s World Cup. The team they played against was Russia, so today’s dish will be a Russian dish: Tender Chicken Breast Fritters or Patties. Although I have eaten Russian food many times in my life, I didn’t cook it that often myself. There is a large Russian community living in Germany and this way one gets to know many Russian people and thus one gets to eat their food as well. I had a good friend of Russian descent while still studying more than 10 years ago and it was her, who introduced me to Russian food. Despite her young years, Karina was a pretty good cook herself and her mother was even better. They made the best pelmeni I have ever eaten and although I have made them several times myself, following their recipe, they were never as good as Karina’s or her mother’s. Karina’s mother, knowing how passionate I am about food and cooking, even wrote some of her best recipes in a blue notebook that I still have and use from time to time today. However, it was not Karina or her mother who gave me the recipe for these wonderful Tender Chicken Breast Fritters or Patties. It was another Russian acquaintance, the mother of a little girl taking part in a swimming course together with my daughter. We met several times, got to chatting and when I told her that I blog recipes for a living, she immediately told me that she has a really good recipe for me. She briefly explained what the recipe was about and I knew that I will have to cook this. 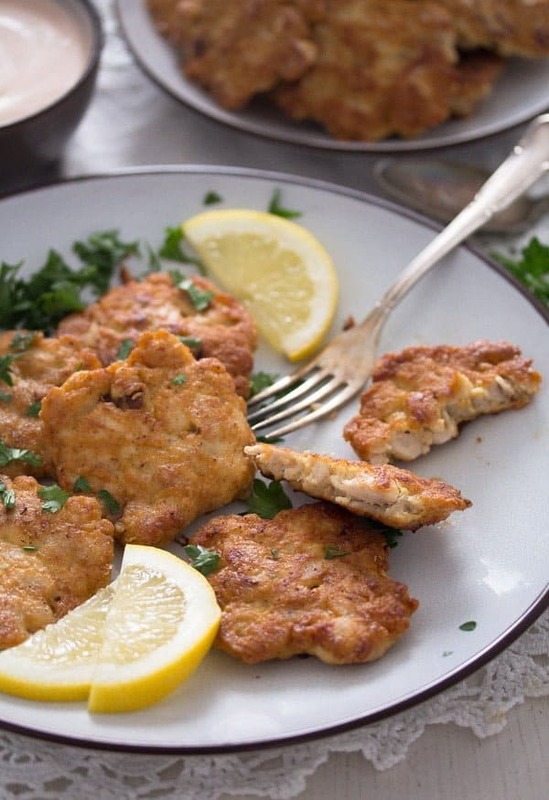 It wasn’t even because of this World Cup recipe series (I hadn’t even thought about that at the time), it was mostly because I knew for sure, that these chicken fritters would be something that my children would love to eat. The recipe is very simple indeed. Few ingredients, little work involved and sooo lovely! 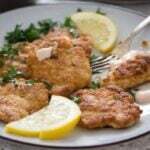 Soft and tender chicken breast pieces, delicately spiced and held together by a delicious pancake-like coating. And the best thing about them, they are so versatile when it comes to serving them, you can have them in so many ways and they will always be delicious. The most tedious part of this recipe must be chopping the chicken breast quite finely, the chicken cubes should not be larger than ½ cm/ 0.2 inches. That will take about 10 minutes, I suppose, but once you’re done, there is really not much left to do. Stir the remaining of the ingredients together and leave the mixture stand in the fridge for several hours. The mixture does need the resting time, so that the ingredients have the chance to blend together and thus hold their shape when fried in the pan. I was told 6 hours should be enough and that the mixture can even be left in the fridge for up to two days, of course, tightly covered in an airtight container. I didn’t really have the whole 6 hours yesterday, but I am happy to say that 4 ½ hours were quite enough, the chicken patties held perfectly together when I fried them. The list of ingredients is very short and simple, only chicken, a little mayonnaise, eggs, a little cornstarch, garlic, salt and pepper. I followed the instructions and the results were absolutely delicious. However, I can easily imagine, playing around with some more spices and herbs. For instance, some ground paprika powder or even curry (not Russian, but tasty for sure), fresh herbs like dill or parsley. 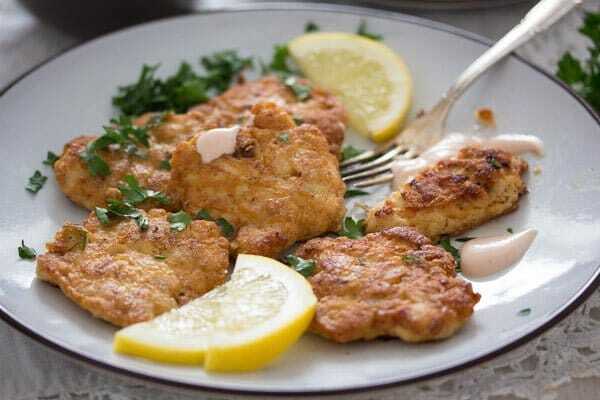 Definitely fry the chicken fritters or chicken patties in several batches. For the double portion I needed about 5 batches in large pan and I had about 40 fritters in the end. Give one heaped tablespoon of chicken batter to the pan and give it a nice shape with the help of the tablespoon you are using. Repeat until the pan is full, but make sure there is enough place between the patties, I think I had about 6 patties in the pan, one in the middle and the rest around it. Cook the chicken patties on medium heat for a total time of about 5 minutes, turning once in between, or until cooked through and golden. 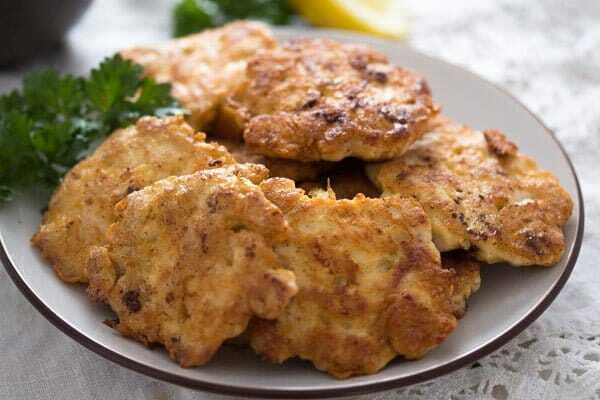 To make sure that the chicken fritters are cooked through, cut one in the middle, the meat should be completely white. 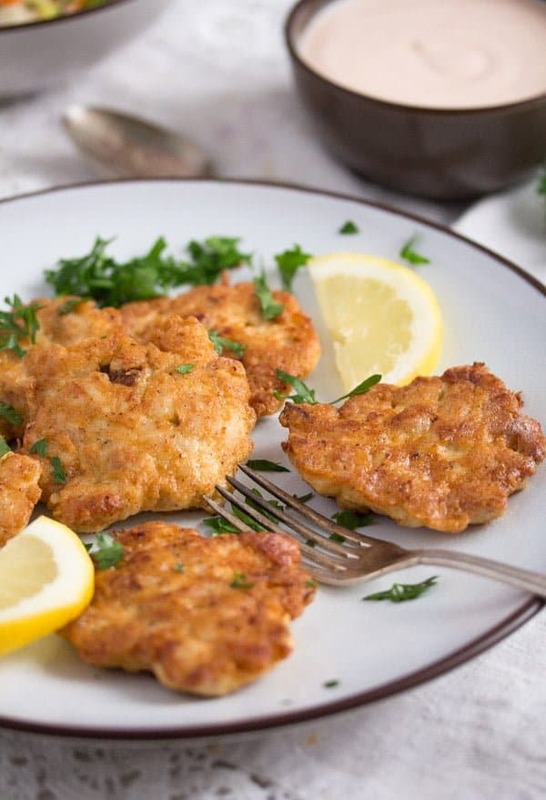 Place the cooked fritters on kitchen paper, which will absorb the extra fat. Repeat with the remaining batter, adding more oil between the batches, when necessary. That’s one of the best things about these chicken fritters, they can be served in so many combinations. You can have them hot with any rice dish, something like this Vegan Tomato Rice with Zucchini and Carrots. You could have them with mashed potatoes, boiled potatoes, fries or a potato dish like this Simple New Potatoes in Tomato Sauce. You could have them in a burger bun with several other toppings or sauces, something similar to this Gipsy Pork Chop Burgers with Mustard and Onions or this Schnitzel Burgers. 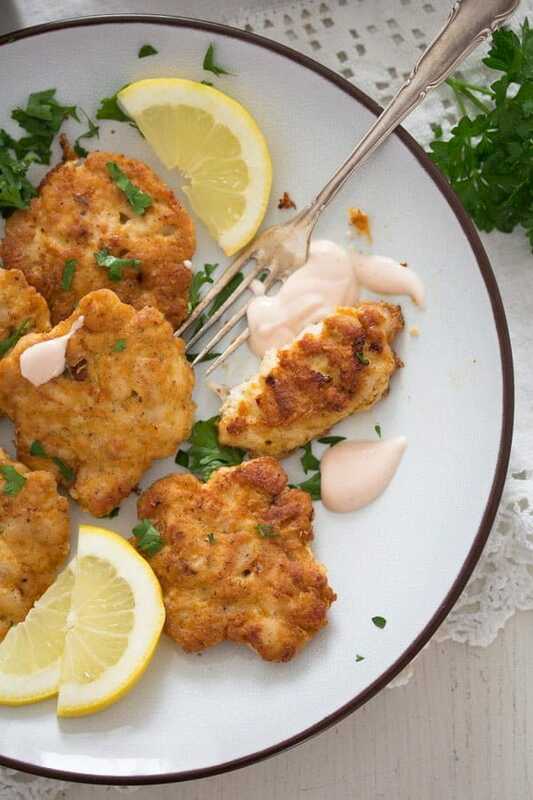 You could serve the chicken fritters or patties as appetizers or eat them while watching the World Cup with a nice dip, for instance this Garlic Sauce with Sour Cream and Tomatoes or this Sweet Chili Sauce. Or you could have them on top of a salad with yogurt dressing, as a light and low-carb dinner. Either way, I hope you give the Russian chicken fritters or chicken patties a try, they are really worth it! Dice the chicken breast into fine cubes, about ½ cm/ 0.2 inches. Give to a bowl, preferably one with a lid. Add the mayonnaise, lightly beaten eggs, cornstarch and grated garlic cloves. Season generously with salt and pepper. You could add other spices or fresh herbs, if you like. Mix well. Cover the bowl with the lid or with cling film. Place in the refrigerator, for about 4-6 hours or overnight. Heat 2 tablespoons oil in a large skillet or non-stick pan. Give one heaped tablespoon of chicken batter to the pan and give it a nice shape with the help of the tablespoon you are using. Repeat until the pan is full, but make sure there is enough place between the patties. Repeat with the remaining batter, adding more oil between the batches, when necessary. You should have about 20 patties. Serve hot or cold as suggested above. What a lovely idea! These sound delicious and I think all children as well as adults would love them!